Hypodontia means the developmental absence of teeth. The number of teeth that are absent is variable and can range from 1 to the entire dentition (termed anodontia). The majority of patients will have only 1–2 teeth missing. The prevalence of hypodontia within the population ranges between 3.5–6.5 per cent. The clinical features of hypodontia are variable and depend not only on the number of missing teeth but also their location within the jaws. The most commonly missing teeth within Caucasian populations are the lower second premolars followed by the upper lateral incisors, upper second premolars and the lower central incisors. The first sign of hypodontia noticed by patients is often the presence of spacing between the teeth at the age of 8–9 years. 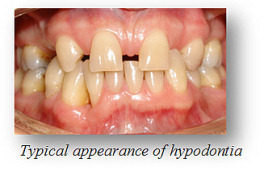 The teeth that do develop in patients with hypodontia often drift into the spaces where teeth are absent. This often leaves the space distribution for tooth replacement non–ideal. Other features of the teeth present include being smaller in size (termed microdontia), having an abnormal shape (e.g. peg shaped) and having delayed development. Because dental development can be delayed on average by 1.5 years, this means that the start of orthodontic treatment maybe delayed compared to other patients. The treatment of hypodontia should involve a multidisciplinary team approach. This means that multiple specialists and the general dentist should be involved in care. The specialists involved include an orthodontist, restorative dentist and paediatric dentist. This allows the best standard of care to be provided. Patients should undergo an assessment by a specialist in orthodontics at the age of 9-10 years. The aim of this assessment is to determine the extent of hypodontia, to ensure that the dentition is otherwise developing normally, and to begin planning long-term care. Orthodontic treatment with fixed appliances can usually commence once the majority of permanent teeth have erupted. This is usually between the ages of 12-14 years. The aim of orthodontic treatment is often to idealise the spaces for future tooth replacement, or to close the spaces if possible, and to treat any other irregularities of tooth alignment or the bite. Orthodontic treatment is often an essential component of managing hypodontia as idealising the spaces for tooth replacement improves the aesthetic outcome of restorative treatment and may also help to increase the lifetime of tooth replacements. Following orthodontic treatment it is necessary to wear retainers to maintain the corrections achieved. Poor compliance with retainer wear can result in a loss of space for future restorative treatment. Restorative treatment is often undertaken to replace missing teeth or enlarge small sized (microdont) teeth. There are several possible methods of tooth replacement including bridgework, implants and dentures. Implants can only be placed if there is adequate bone available to house the implant and when the majority of facial growth has occurred which usually corresponds to 17 years of age in females and 19 years in males. Bridges or dentures can be used as a temporary interim measure before this point is reached. In the long term it is important that orthodontic retainers continue to be worn to some degree if the tooth alignment is to be maintained. All restorative treatment will require follow-up and maintenance.